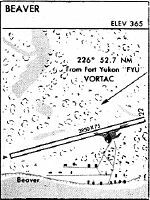 COMMUNICATIONS PRVDD BY FAIRBANKS FSS ON FREQ 122.05 (FORT YUKON RCO) OR FREQ 122.15 (YUKON RIVER BRIDGE RCO). A110-1 RY COND NOT MONITORED; RECOMMEND VISUAL INSPECTION PRIOR TO LANDING. A110-2 SNOW REMOVAL OPERATIONS DURING WINTER--MONITOR CTAF. A110-5 ACTIVE ROAD TRANSITS RY 1000 FT FR RY 05 THLD. A110-8 COLD TEMPERATURE RESTRICTED AIRPORT. ALTITUDE CORRECTION REQUIRED AT OR BELOW -42C. A81-APT ACTVT MIRL RY 05/23 - CTAF.